beetles. Photo: Jeff Hahn U of M Ext. 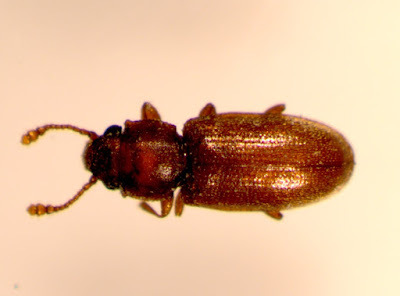 Foreign grain beetles are about 1/12 inch long and reddish brown. Under high magnification, you can distinguish this beetle from other small beetles by a pair of peg-like projections behind their head. These insects have also been confused with bed bugs. Because of the increase in bed bug problems, people have been sensitive to small insects they can not identify. Once these insects are examined closely, you can see the shape between these insects is different and that foreign grain beetles have wing covers, which bed bugs lack. Note: Be sure any insect that you do not recognize is correctly identified by an expert before attempting any control. Foreign grain beetle are scavengers, feeding on fungi, mold and organic material. Despite their name, homeowners rarely see foreign grain beetles attacking their dry food products, such as flour or pasta, unless it is old and moldy. Why are they in my newly built home? In most cases, foreign grain are associated with newly constructed buildings. Moisture from the green wood supports mold and fungus on wood and drywall. Foreign grain beetles feed on this, allowing their numbers to build up in wall voids. Eventually, they come out into the living areas of homes. 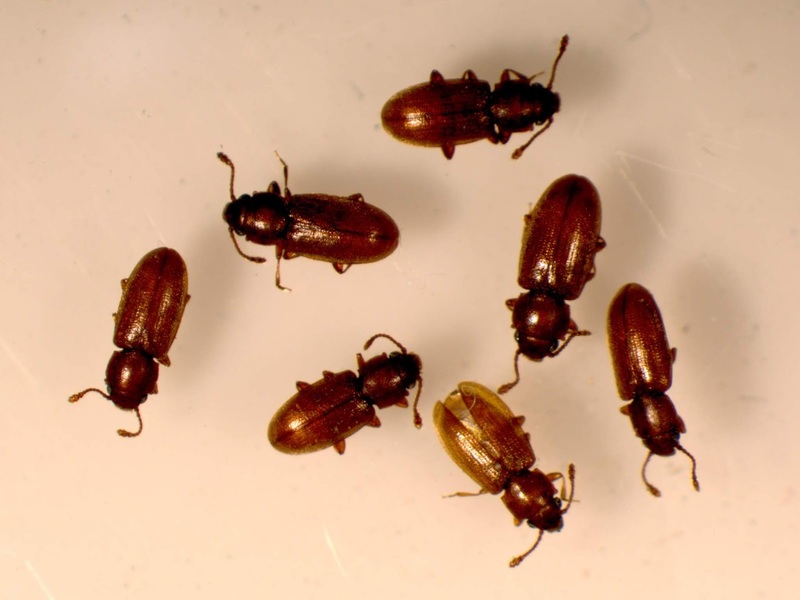 Foreign grain beetles can also be found in older homes with high humidity and poor ventilation. only nuisances. Photo: Jeff Hahn, U of M Ext. What is the best control? Foreign grain beetles are harmless; they do not bite people, damage wood or infest sound food. They are only annoying when they are present. The best control is to physically remove them, like with a vacuum cleaner or just ignore them. Insecticides are not necessary because the problem is temporary and the insects are harmless. Expect to see foreign grain beetles until late September or early October and then they go away on their own. When they are infesting new homes, they persist only for one or two years until the wood dries and can no longer sustain them.